Healthy Meals for Those Who Matter Most No more frozen dinners or fast food! Lifestyle begins at home… “With the recent statistics on obesity rates in North American children, and news that our children’s generation are still likely to be less healthy than ours, it is becoming increasingly clear that one of the challenges in improving our diets is not lack of information, we “know” too much already! I firmly believe the answer is in doing. All we have to do is get back to the kitchen, and get our families back to the table to eat, which should be one of the basic rights of any family. In Rose Reisman’s Family Favourites, I wanted to put together a primer for parents, so that we can all re-learn the basics of nutrition and meal management, within the challenges of today’s challenging environment. 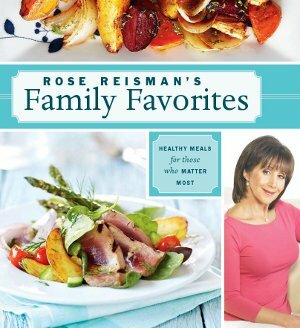 The change must come from individuals, one kitchen at a time.” In her latest book, Rose Reisman offers over 270 practical recipes for quick and nutritious meals that are perfect for any family, without compromising taste. With no-nonsense advice on how to eat well, guidance on creating realistic meal plans and nutritional analysis accompanying each recipe, this book will help all Canadians take charge of their family’s health. From packing wholesome school lunches to making light deserts, Rose shows how to juggle hectic schedules and still make great healthy meals that families can enjoy, together. And, coupling these perfect meals with recommendations for healthy choices when eating out, and the inside scoop on health fads, diets, and packaged food, will ensure positive choices guaranteed to improve individual and family health!